We’ve Moved! Find Great Healthy Living Content at Quarto Lives! Welcome! If you’re looking for BodyMindBeautyHealth.com you’ve found it! BodyMindBeautyHealth is now Quarto Lives and we are showcasing the same great content that we were before – just with a new look! Change is in the Air – BodyMindBeautyHealth will be moving soon! How are you doing in your Plank-A-Day-In-May Challenge? If you’re following along with Jennifer DeCurtins, author of Ultimate Plank Fitness, you could be on your way to a super-strength core! So, we’re all on Day 8 now of the #UltimatePlankChallenge, which means it’s time for a forearm plank. In this advanced variation of the forearm plank, both the arms and legs are in movement to create a true challenge of core stabilization. Get into a straight body position from your head through your heels with your shoulders stacked over your forearms. While maintaining forearm plank position, alternate reaching your right hand out, tapping the floor, and bringing it back to the starting position. Then reach your left hand out and back to the starting position. Then reach your right foot out and back to the starting position, and finally your left foot out and back to the starting position. This is one rep. The double movement of this plank introduces a massive stabilization challenge. A safe, challenging, and effective method of core conditioning, planking is one of the best ways to get fit and toned. Variations of planks are used across many fitness domains including traditional group exercise, personal training, home workouts, yoga, pilates, barre, CrossFit and more. Not only are planks perfect for crafting six-pack abs, they also target shoulders, pectorals, biceps, triceps, glutes,quads, and hamstrings. They increase the heart rate, offer calorie-busting cardio exercise, and create healthy muscle tone. Ultimate Plank Fitness features 100 different variations of planks that can be used to customize your workout. Easily increase the difficulty of your core strengthening exercises by adding stability balls, gliders, and weights. Each exercise includes a step-by-step photo demonstration, points of performance, where to engage, along with common faults to detect ways to improve your fitness. Finally, CrossFit coach, personal trainer, and fitness instructor, Jennifer DeCurtins provides you with ten 5-minute workouts incorporating several planks that you can use to target trouble areas and build strength. With countless variations of the exercise, ranging from traditional planks to side plank variations and planks using external weights or unstable surfaces, your entire workout can be programmed around the plank! Work your way to a healthy core with Ultimate Plank Fitness. Hockey Playoffs are here. For fans, it means fun times at the games. For players, it means playing harder than ever. 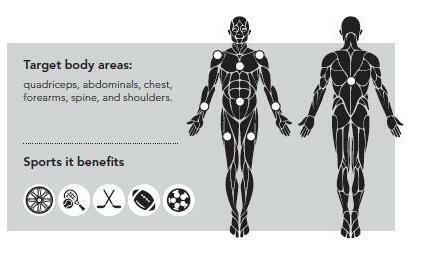 Hockey athletes know that playing hard can mean a tough time on your back and quads. One way to stretch it out is to try this yoga position from Sean Vigue, author of Power Yoga for Athletes. If you want a happy spine and loose quadriceps, drop down and do a Bow. Lie on your stomach, and reach your arms to your sides, while bending your knees 90 degrees. Lift your chest, press your pubic bone into the mat, and grab your feet or ankles. You may use a small towel or a strap if you’re unable to reach your feet or ankles. Press your toes to the sky, while lifting your chest and keeping your chin slightly tucked. Stretch your arms as much as possible, and pull your shoulders back. Hold for five to ten deep breaths or until it’s not comfortable, and release. Hockey, football, baseball, golf, swimming, lacrosse – whatever your sport of choice, yoga will help you to improve focus, flexibility, and performance. Power Yoga for Athletes is perfect for those who want a total body and mind workout. Yoga is the ideal cross-training tool and a perfect stand-alone exercise, whether you’re looking to improve balance, focus, control, breathing, posture, or flexibility; strengthen your back, joints, or core; or reduce or heal from injury. Featuring more than 100 yoga poses from instructor Sean Vigue, Power Yoga for Athletes incorporates more than just poses. It describes a whole-body program for cross-training and conditioning. Each yoga pose features step-by-step directions, instructional photography, muscles being worked, overall benefits, and the sports for which each pose is ideal. Get the balance, strength, and focus you need to perform at your best. Working out at home has so many advantages and starting up a new WOD or CrossFit routine can be a lot of fun. If you’re spending less time at the gym and more time getting fit, you might want to get a few key pieces to push your workout to the next level. In his upcoming book, 365 WODs; Burpees, Deadlifts, Snatches, Squats, Box Jumps, Kettlebell Swings, Double Unders, Lunges, Pushups, Pullups, and More, Blair Morrison takes you through eleven key tools you’ll need to get get the most out of your core exercises. 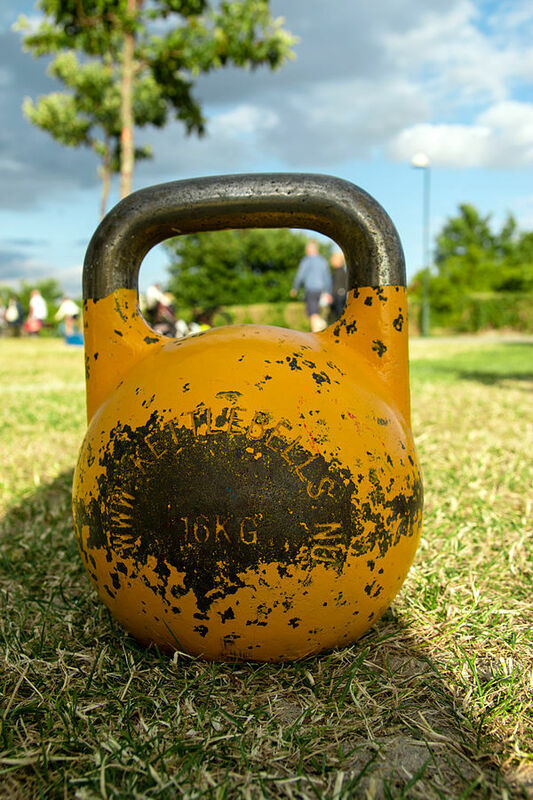 For me, a 16KG (35 lb) kettleball is a good place to start. Photo by Knuckles, courtesy of Wikimedia Commons. Ideally, your sandbag will be refillable. This will allow you to adjust the weight of the sandbag as you progress. With a utility knife (or drill), some durable glue, and sand, you can convert an inexpensive rubber ball into your own personal medicine ball. You only need one to start. The pure iron ones are easier to grip than the rubberized ones. I suggest women begin using an 8 kg (18 lb) and men a 16 kg (35 lb). You can probably get away with three sets: a light, medium, and heavy (based on ability). Avoid adjustable dumbbells, which can add time to your workouts. Go with wooden rings. They’re much easier to grip and last much easier to grip and last longer. If it starts and stops, it’s good. You might try just using You might try just using the clock function on your smartphone. There are a lot of DIY options out there, and they aren’t too difficult to build. It’s definitely cheaper than buying one and shipped. Choose an option with three different heights depending on what side you rest it on—rather than one that relies on stacking. Also, wood is better on your shins than metal. Rubber horse stall mats are the best. They’re easy to clean and they never tear or wear out. Look for them at a tractor supply stores or pet stores. Don’t waste money on a speed rope unless you already know what you’re doing. If you’re just starting out, any jump rope will do. Although manila ropes (the brownish ones) are cheaper, brownish ones) are cheaper, they’ll make a mess and tear up your skin. Spend a little more money on a polyester fiber rope. Often tractor supply stores have old tires where the tread has worn through on one side, and you’ll either get it for free or really cheap. You should also check online. But keep in mind, no two tires are the same. Before you buy it you’ve got to feel it to see if it’s something you can flip. Challenge your body with the ultimate resource of daily workouts. Fast-paced exercise programs based on high intensity interval training are sweeping the nation. Their recipe for success is the WOD, or workout of the day. Planks, squats, crunches, pushups are all great, but changing up a routine can be challenging, and it can be difficult to find a resource for so many different workouts. Until now. The ultimate resource of exercises, 365 WODs will help you push your limits all year long. Oh, boy. Could you just not pass over the Passover Matzo Soup? Did you indulge a bit too much in the Easter candies? Perhaps you’re feeling a little like a jelly bean yourself. Well, it’s time to combat the “Cadbury effect” with this effective exercise to tighten up your obliques. The authors of Core Fitness Solution, Kendall Wood and Michael De Medeiros, are just the people to help you do this routine right. There’s nothing simpler than standing on your two feet and crunching side to side, right? Wrong! In fact, even the most seasoned trainers often do this exercise incorrectly. It’s not about how much weight you can carry in your hands, or how much weight you can curl with your biceps. Instead, it’s about how much weight your obliques can move from a standing bend position. Sure, you could cheat through this one and swing the weight around and pretend that you hit your obliques. Or you could go light, steady, and meticulous and increase your power exponentially. Your call. START: Stand with your feet shoulder width apart, holding a dumbbell in each hand at your sides. ACTION: Bend on one side by lowering your shoulder while contracting your obliques and return to the start. Repeat on both sides. Try perfecting the movement without weights if you’re just getting the hang of this exercise. Raise and fully extend your arms so the weights are above your head and parallel to the ceiling. Perform the reps while focusing on your oblique power to create the movement. The promise of building a six-pack is found in many places–Results, however, are not. With Core Fitness Solution, those results are finally attainable. With more than 5,000 customizable solutions in this book, you pick the exercises. You decide the workout, the location, the duration and the intensity. Finally, a leaner middle, a stronger core, and the set of abs you’ve always wanted can be yours. Former editor-in-chief of Men’s Fitness, Michael de Medeiros, and “King of Abs,” Kendall Wood, have handpicked the most effective exercises to target all areas of your midsection. Crafting your core has never been so simple. Michael De Medeiros is the former vice president and editor in chief of Men’s Fitness magazine, former editor in chief of Maximum Fitness magazine, and author of 13 books, including historical biographies, educational textbooks, and active health and fitness books. He has been nominated and shortlisted for several awards, including best book and best book in a series (Weigl Publishers). Kendall Wood, NASM CPT, M.Ed., CES, PES, FNS CERTIFIED, the “King of Abs,” is a multi-time fitness magazine cover model, NASM certified personal trainer, health advocate and a forerunner in the fight against childhood obesity. His foundation, Smart Moves, works to end obesity for children by partnering up with school boards and family associations. He is also the promoter of FitScience’s annual fitness contest in Atlanta. Gearing up for a big game or a long run? Sean Vigue has the perfect energizing yoga pose for you in Power Yoga for Athletes. The Chair will give you a nice burst of energy and give your legs the power they need to go the distance. Need some energy? This pose will energize your whole body and build strong glutes and legs. It will also improve balance and focus. From Mountain pose (above), exhale and press your bum back into a squat position by placing your weight into your heels and gluteus. Inhale and reach your arms and chest to the sky, while keeping your shoulders relaxed. Spread your toes, and relax your fingers. Press your bum back farther as you exhale, and lift your arms higher as you inhale. Your toes should be able to move freely. Hold for five to ten deep breaths. Modification: Place your hands together in front of your heart (prayer position).